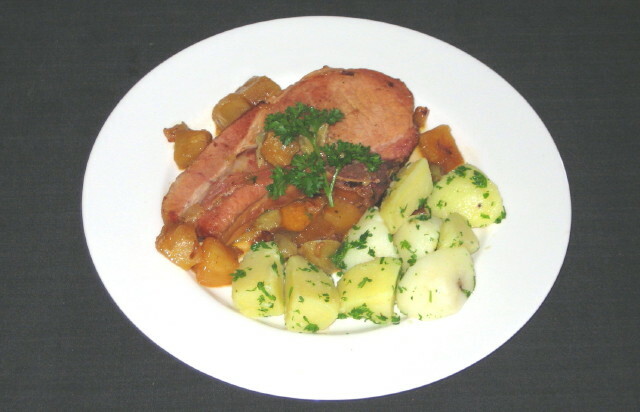 Kassler is a cured and smoked pork chop that originated in Germany and is traditionally cooked with sauerkraut and potatoes. 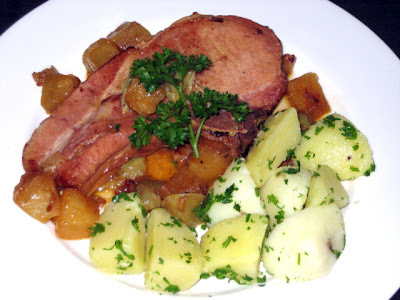 Since my better half is not crazy about sauerkraut like I am, she asked me to cook it with pineapple instead. 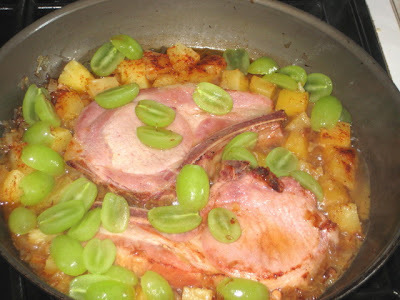 Few years ago, I came up with a meal that was made with pork cutlet rolled with cheese and smoked bacon slices and cooked in white wine and with pineapple and green grapes. It was a hit at my dinner parties because at the table I poured in some hot rum and flambé the sauce. Real retro, I have to say. 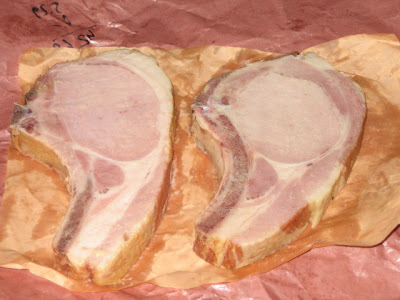 If you can’t get your hands on a real Kassler you can sub with a regular thick cut pork chops, brined for 4 hours in salted water with few drops of liquid hickory smoke. After 4 hours, drain, rinse under running cold water and pat dry with paper towel. In medium hot frying pan heat oil and butter and sauté onions till light golden brown. Add paprika and chilli powder, stir an push onions on side. Place pork chops in center of frying pan and brown on both sides, about 4 – 5 minutes each side. Meanwhile, boil potatoes in salted water, drain when done, toss with chopped parsley and butter and keep warm. Pour in wine and reduce to half. Add pineapple chunks and grapes, cover and simmer on low for about 30 minutes, turning once halfway through and at the same time stir the pineapple and grapes. Add more wine if sauce is too thick. 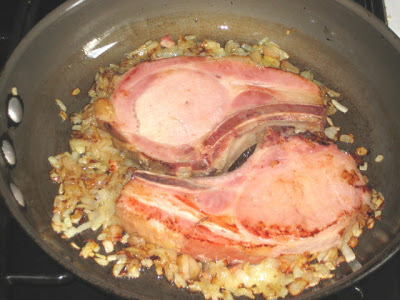 To serve, pour half the sauce on each preheated plate, place pork chop on top of sauce and potatoes on side. I bought these chops at local farmer's market. No cash register, the wrapper serves as cash register tape. Check top left corner on photo. Kassler and onions are cooked and ready for wine. Another 15 minutes and it will be ready for plating. I get hungry just looking at it!